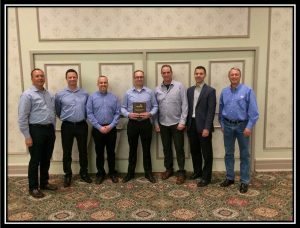 In March 2018, Imperial presented the Cando team with the Gold Safety Award for their work at the Imperial CFO (Canada Fuels Operations) railyard in Edmonton for the 2017 calendar year. Imperial sets the operating standards extremely high for the 200+ contractors that work in their CFO division, which is why their company safety record is among the best in the Canadian energy industry. Imperial awards gold, silver and bronze awards to their contractors that work at their operations across the country at their annual Contractor Safety Forums held in Edmonton and Toronto. This year, several Cando employees were present in Toronto to accept the award, including Cody Birkett, the Cando Assistant General Manager for Alberta East. Only two gold awards were handed out at the forum. Upon request by the IOL Canadian Fuel organization senior management, Birkett spoke at both the Edmonton and Toronto forums about how Cando has implemented and embraced IOLs Behavioral Based Safety System (LPS) while ensuring Cando’s TrackSmart ideals are upheld to stay focused on safety. “This award is a result of our dedicated employees’ unwavering commitment to safety. I am proud to be associated with such a strong group of safe and customer-focused railway employees,” says Birkett. Left to right: Jim Rose (Northern Operations Manager, CFO), Steve Bromley, Jeff Allen, Cody Birkett, Steve Gallagher, Robert Ballinger (Area Manager Eastern Canada, CFO) and Kevin Hobbs (Global Director ExxonMobil Midstream). Missing: Laurie Quilichini (now retired) who supported the team by driving continuous improvements in safety practices over the years. Cando was presented the Silver Award in March 2017 for their impressive safety record for the 2016 calendar year. The Gold Safety Award is presented to contractors that achieve above 95% on the IOL safety scorecard, which is incredibly difficult to accomplish. Cando handled over 115,000 railcars at Imperial Edmonton in 2017, and there were zero incidents and zero lost time injuries with close to 82,000 crew hours. Achieving the gold award wouldn’t have been possible without the safe and hard-working men and women within the Cando team. Safety at Cando Rail Services is an intrinsic core value, and it starts with every employee.